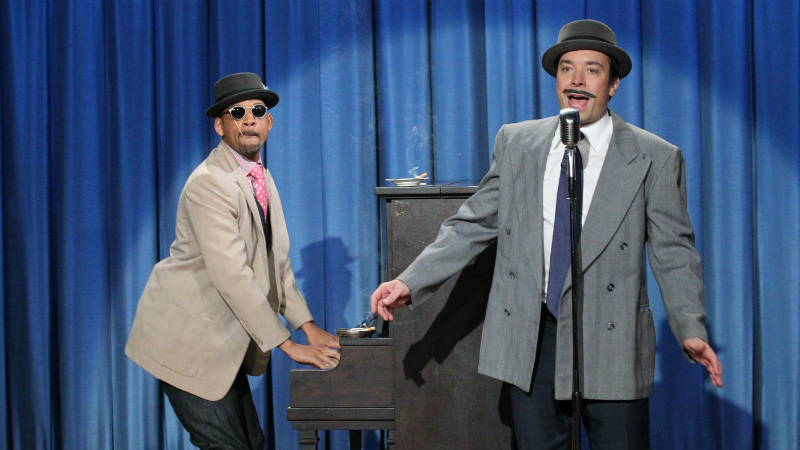 Please note in your historical ledgers: On February 17, 2014, Will Smith and U2 will become the first guests on Jimmy Fallon’s version of The Tonight Show. Smith will be shilling for the confusing-looking Winter’s Tale, which can’t be as fun as a giant celebrity stopping in just to celebrate the occasion and help create two or more viral clips for the ages (maybe by stealing Bono’s glasses?). It’ll be a good test, anyway, seeing if Fallon can get Big Willie to do something more exciting than talking about a movie or the Young Smiths or singing the “Fresh Prince” theme again. (Kick off the “Wild Wild West” resurgence, maybe?) “It should be goofy and funny and make people laugh,” Fallon said of the new Tonight Show, speaking at the Television Critics Association 2014 press tour. “That’s our job … I wish Steve Allen and Johnny Carson were still around to see what we’re going to do with the show.” Speaking of Allen and Carson: This will be The Tonight Show Starring Jimmy Fallon, versus the “With” the show used for Leno and Conan. Shiny! Jay Leno’s final week at the big desk begins February 3 and will see appearances from Matthew McConaughey, Sandra Bullock, Garth Brooks, Charles Barkley, and Billy Crystal, Leno’s first guest way back in May 1992. So far Louis C.K. and Leslie Mann have been among the guests to offer emotional good-byes — can’t wait to see who else follows suit in the next few weeks. Fallon will also appear on the final week, meaning there’s a chance for him and Leno to have some on-air debate about The Tonight Show’s future; Leno has already advised Fallon to boost the monologue from three or four minutes to Jay’s traditional 10ish, so as to cover a bunch of that day’s important news for the 11:35 audience. Meanwhile, Fallon’s affinity for prerecorded sketches like “Game of Desks,” “Joking Bad,” and “Downton Sixbey” should remain untouched. Seth Meyers’s final episode as a member of the Saturday Night Live team — meaning his last time hosting “Weekend Update” — will come on February 1. Then the new Late Night will welcome fellow former SNLer Amy Poehler as Guest No. 1 on February 24. “We are going to have a monologue, guests, music, comedian, but the biggest way we can define ourselves is the two or three acts of comedy before the guests come out,” Meyers tells USA Today about the new format, which will likely include Drunk Uncle– and Stefon–ish characters riffing on the news from time to time. And despite an earlier report, Meyers’s Late Night will feature a house band, even if Meyers seems a little uneasy about lacking musical hipness compared to Fallon. But “if you get hung up on the legacy of what you’re taking over, it’s tough to do the work,” he says. Now that your starry gaze is trained all futureward, here’s a chance to reexamine the promos.